The prices of homes for sale in Dallas continue to increase. With the overabundance of people moving to the area for jobs, real estate prices will probably continue to go up in the coming years. 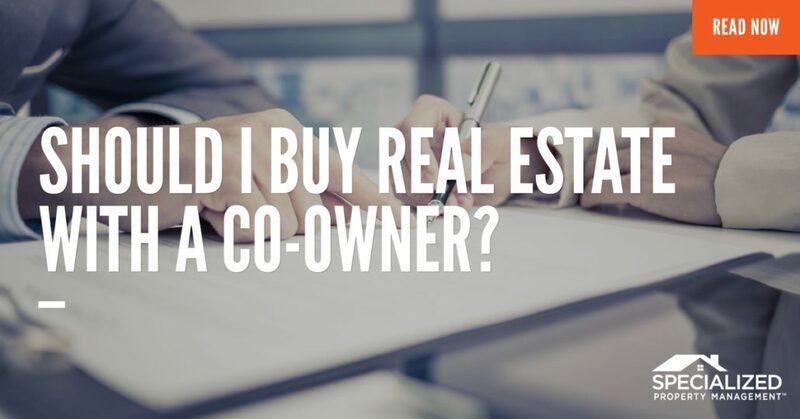 So, if you’re a Dallas property manager, and you want to invest in a rental home but you can’t do it alone, should you buy the property with someone else? Specialized talks about why this may or may not be the right thing for you. To qualify for a mortgage, your down payment and income must be sufficient enough to ensure that you can afford it! Depending on your occupation, it can be challenging to qualify for a mortgage on just one income. With the help of a business partner, all of your assets are considered. That means, Dallas property managers, you just may be able to afford that nice rental property you spotted the other day! Double the income and double the down payment usually equals a nicer home in a better neighborhood where you can charge more rent and stay competitive. You shouldn’t co-own a home with someone you just met because you don’t know if you can rely on someone you don’t know. Before signing any papers, be sure you can depend on the person you are co-owning the home with. Since you and your business partner will both be on the house title, you’ll also have to pay the mortgage every month. Make sure you and your partner are in a very good financial situation and able to easily pay the mortgage before looking at homes. If you don’t know already, you should ask your partner about their past financial history and find out their credit score too. Iron out all the financial details, and then split up the responsibilities that come along with buying a house. Just because your business partner is your former best friend from high school, does not mean you should count on them to remember every detail of your arrangement. An experienced Dallas property manager hires an attorney to draft up the business agreement and help outline the necessary landlord/tenant laws you expect to be followed. A lawyer can also provide you with information about additional insurance, liability concerns, and outline what to do in case of a worst possible scenario. By adding a clause to your ownership agreement that deals with unforeseen disputes, you can ensure that if your relationship with your partner goes sour, no one is left high and dry. Thinking about investing in a rental property? Contact the experts at Specialized today to get started!